Ok I am in love with this color! 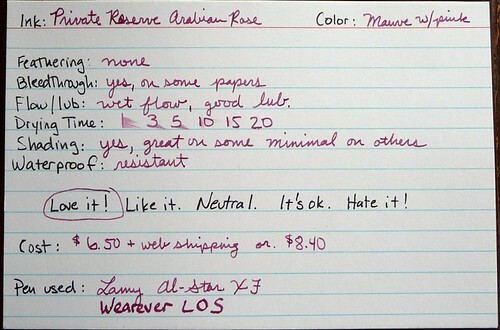 It is a great pinkly mauve. It is bright and saturated though subdued. It reminds me of a more conservative version of Noodler’s Saguaro Wine. Bleed through depends on how wet your pen writes and what kind of paper you are using. The drying time is slow. It took nearly 20 seconds for the ink to dry. Lefties be forewarned. Shading can be very good, but as usually, it will shade better on some than on others. It is water resistant. I ran it under the tap for about 5 minutes and rubbed across the writing and it was still completely legible. I also dropped water on it, and the ink would spread but remain legible. So as long as the ink has had time to dry you should be able to make it through an accident.